A landmark on one of Europe's most scenic rivers, Four Seasons Hotel Gresham Palace Budapest embodies historic grandeur and youthful exuberance. This lovingly restored palace brings together two million mosaic tiles, an ornate Preciosa chandelier, dramatic stairways and, most memorable of all, thoughtful Four Seasons hospitality. Combining regal splendor and residential comfort, 160 guest rooms give Art Deco aesthetics an update with contemporary shapes and fabrics. Through floor-to-ceiling windows, 16 suites afford enchanting views of the River Danube, Chain Bridge, Buda Hills, Royal Castle and Fisherman’s Bastion. Vibrant and inspiring, Kollazs, the contemporary brasserie, is a collage of many European culinary influences, set against the timeless backdrop of the Danube. The SPA harnesses Budapest's renowned heritage in wellness, with a multitude of unique and transformative treatments. 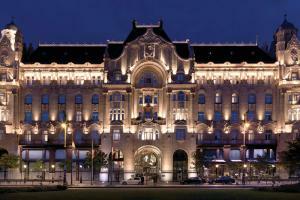 Set in the heart of Budapest's historic center, overlooking the iconic Chain Bridge. The hotel is 15 miles from Budapest Liszt Ferenc International Airport, about 30 minutes by car.